De Stijl ( /də ˈstaɪl/; Dutch pronunciation: [də ˈstɛil]), Dutch for "The Style", also known as Neoplasticism, was a Dutch art movement founded in 1917 in Leiden. De Stijl consisted of artists and architects. In a narrower sense, the term De Stijl is used to refer to a body of work from 1917 to 1931 founded in the Netherlands. Proponents of De Stijl advocated pure abstraction and universality by a reduction to the essentials of form and colour; they simplified visual compositions to vertical and horizontal, using only black, white and primary colors. According to Theo van Doesburg in the introduction of the magazine "De Stijl" 1917 no.1, the "De Stijl"-movement was a reaction to the "Modern Baroque" of the Amsterdam School movement ( Dutch expressionist architecture) with the magazine " Wendingen" (1918-1931). The name De Stijl is supposedly derived from Gottfried Semper's Der Stil in den technischen und tektonischen Künsten oder Praktische Ästhetik (1861–3), which Curl  suggests was mistakenly believed to advocate materialism and functionalism. The "plastic vision" of De Stijl artists, also called Neo-Plasticism, saw itself as reaching beyond the changing appearance of natural things to bring an audience into intimate contact with an immutable core of reality, a reality that was not so much a visible fact as an underlying spiritual vision. In general, De Stijl proposed ultimate simplicity and abstraction, both in architecture and painting, by using only straight horizontal and vertical lines and rectangular forms. Furthermore, their formal vocabulary was limited to the primary colours, red, yellow, and blue, and the three primary values, black, white, and grey. The works avoided symmetry and attained aesthetic balance by the use of opposition. This element of the movement embodies the second meaning of stijl: "a post, jamb or support"; this is best exemplified by the construction of crossing joints, most commonly seen in carpentry. De Stijl was influenced by Cubist painting as well as by the mysticism and the ideas about "ideal" geometric forms (such as the "perfect straight line") in the neoplatonic philosophy of mathematician M. H. J. Schoenmaekers. The De Stijl movement was also influenced by Neopositivism. The works of De Stijl would influence the Bauhaus style and the international style of architecture as well as clothing and interior design. However, it did not follow the general guidelines of an "-ism" (e.g., Cubism, Futurism, Surrealism), nor did it adhere to the principles of art schools like the Bauhaus; it was a collective project, a joint enterprise. 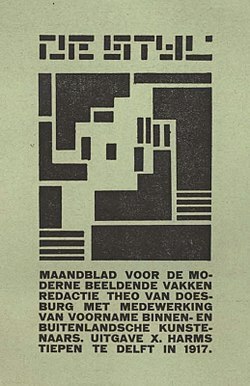 During that period, Theo van Doesburg started looking for other artists to set up a journal and start an art movement. Van Doesburg was also a writer, poet, and critic, who had been more successful writing about art than working as an independent artist. Quite adept at making new contacts due to his flamboyant personality and outgoing nature, he had many useful connections in the art world. The De Stijl influence on architecture remained considerable long after its inception; Mies van der Rohe was among the most important proponents of its ideas. Between 1923 and 1924, Rietveld designed the Rietveld Schröder House, the only building to have been created completely according to De Stijl principles. Examples of Stijl-influenced works by J.J.P. Oud can be found in Rotterdam ( Café De Unie [ nl]) and Hoek van Holland. Other examples include the Eames House by Charles and Ray Eames, and the interior decoration for the Aubette dance hall in Strasbourg, designed by Sophie Taeuber-Arp, Jean Arp and van Doesburg. ^ Denker, Susan A. (September 1982). "De Stijl: 1917–1931, Visions of Utopia". Art Journal. 42 (3): 242–246. doi: 10.1080/00043249.1982.10792803.